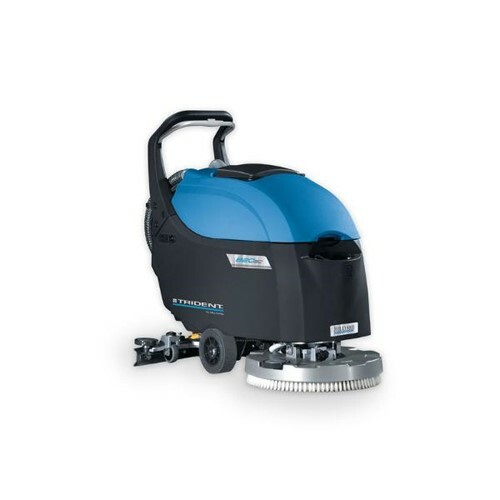 The Hillyard Trident B20SC is a walk-behind, brush-assisted, automatic scrubber that makes cleaning simple and easy. It's designed to deliver high productivity and low total cost of ownership. Clean up to 16,000 sq. ft. per hour with the 20" disc scrub head. An innovative aluminum chassis designed to last a lifetime is corrosion resistant, sturdy and durable, light weight, and provides a precision fit for components. Simple, intuitive controls make it extremely easy to operate. The B20SC comes with onboard battery charging, simplifying recharging. The B20 body completely covers the frame and the components, protecting them against damage from impacts, extending component life and minimizing repair cost. The B20 body completely covers the frame and the components, protecting them against damage from impacts, extending component life and minimizing repair cost. Up to 5 working hours on a single battery charge. The compact design of the B20 ensures high visibility during operation, and while cleaning along walls or around obstacles. The electronic control panel with AUTO feature activates all scrubbing functions at the same time ensuring constant cleaning performance. The dripless hose for water filling can be directly connected to most faucets, saving time and simplifying the filling operation. Accurately mix the proper amount of cleaning solution, eliminating waste and ensuring performance. It?? ?s cost effective too. The chassis is a single piece engineered out of aluminum. It?? ?s more impactresistant and corrosion-resistant than traditional scrubber frames constructed from steel. The B20 will perform well even in toughest environments.